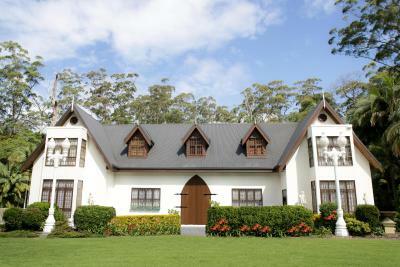 Lock in a great price for Mt Tamborine Stonehaven Guest House – rated 9.1 by recent guests! The asmoshere, the environment, the owner, the accommodation and all facilities was so great! It's very close to the main street on the left side of property and also on the right side that you can walk to all the cafe near Curtis falls. Ofcourse you can walk to beautiful Curtis fall too. Room size, excellent wifi (so many properties say theirs is good but it is often not - this one lived up to promise), lovely gardens and stream out the back. A lovely and very interesting themed place to stay with lovely grounds and great location. Big room too. The location was great so we walked everywhere. The room was comfortable and the owner was friendly and welcoming. the house itself looks amzaing, how ever the room itself is very basic and not worth the money. From the images online of Stonehaven, of the classic Scottish facade and interior, my expectations were high and they were met and exceeded! Walking in we were met by the lovely Tania in the cosy and warm reception (Scottish themed of course) and were shown to our equally cosy and beautiful room, overlooking the picturesque garden (complete with the relaxing sound of the nearby creek). Tania was a gracious host and gave us so many recommendations for nearby restaurants and activities (which all were fantastic). I only have good things to say about Stonehaven and recommend it to anyone wishing to stay in the Mt Tamborine area. It's close to all the local sights and experiences and was a dream to stay at. The spa bath, huge bed and charming old style decor. Room was huge and bed was comfortable. Views from our room was magnificent. Host/owners beautiful people. Mt Tamborine Stonehaven Guest House This rating is a reflection of how the property compares to the industry standard when it comes to price, facilities and services available. It's based on a self-evaluation by the property. Use this rating to help choose your stay! Surrounded by 2 acres of beautiful gardens and ponds, the 4.5-star Stonehaven Manor offers boutique accommodations with a spa bath and free WiFi. Curtis Falls Rainforest Walk is just 350 feet away. 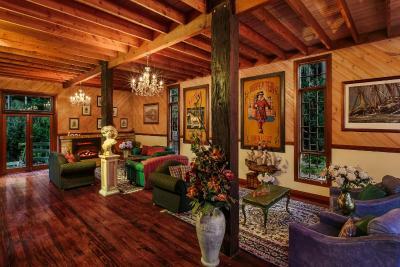 Mt Tamborine Stonehaven Guest House features wooden floors and high cathedral ceilings. The cozy guest lounge features a fireplace, and is the perfect place to relax with friends. 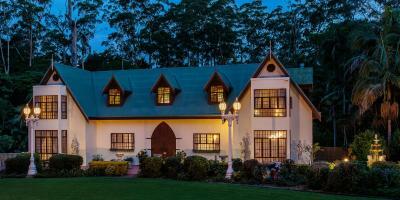 When would you like to stay at Mt Tamborine Stonehaven Guest House? This air-conditioned room offers tea/coffee making facilities, a fridge and a flat-screen TV. House Rules Mt Tamborine Stonehaven Guest House takes special requests – add in the next step! Mt Tamborine Stonehaven Guest House accepts these cards and reserves the right to temporarily hold an amount prior to arrival. Please note that there is a 2% charge when you pay with a Visa or Mastercard credit card and a 2.75% charge when you pay with an American Express credit card. 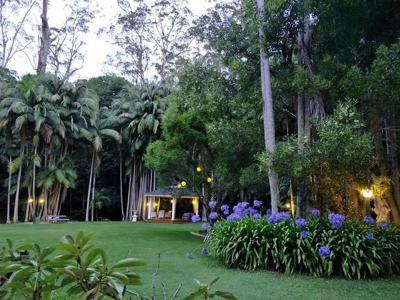 Please inform Mt Tamborine Stonehaven Guest House of your expected arrival time in advance. You can use the Special Requests box when booking, or contact the property directly using the contact details in your confirmation. Central location, nearby to where we had to attend a private function. The host was helpful and the accommodation itself was neat, clean and tidy. The Breakfast hamper was superb. The location was lovely. We enjoyed sipping tea in the gazebo along the quiet little creek at the back of the property. Fantastic location, great views, super clean and comfortable. Staff was welcoming and accommodating. We will return for another stay. Absolutely lovely! Very quiet, loved the garden and creek at the back of the property. Huge windows were great for the view of the gardens and the fresh air. Lack of taxis services. Need to allow a good 30 to 45mins for one to arrive. Pleasant surroundings, comfortable room and nice atmosphere. vehicle access to the unit as we had a lot of luggage to carry. I loved the spa and really loved the back yard. The ambience of the whole property including the accommodation and the extensive gardens. It is in a good location with access to all amenities. The morning hamper breakfast was just too much! It was really varied and one could not leave hungry. All in all an excellent venue. good bed, quiet location , lovely garden and very healthy yummy breakfast. lovely hosts. thank-you We WILL be making return visits.